Cloud software has revolutionised how businesses operate. If you don’t already have your head in the clouds, here’s a list of reasons why you should. Software reports and budgets can be tailored to suit your business needs and provide more relevant information. Cloud accounting programs have numerous add-on options, including inventory management, CRM, invoicing, and payroll. Together with easily customisable reporting functions it’ll accurately track specific business areas in real-time. As an added bonus, most cloud accounting software packages integrate into reporting apps that provide you with dashboard and management reports. These will give you insight into your business by assessing trends, business performance, while simultaneously highlighting improvement opportunities. Cloud software allows you to have access to real time data anytime, anywhere. Unlike other accounting software, most cloud software doesn’t need to be installed for use, allowing you to have access on all your devices. Functions such as bank feeds and automated reconciliations eliminate the need for data entry – saving time and eliminating human error. The software updates with the click of a button, ensuring you’re using the most relevant and updated software for your business. Software specialist technicians can access your file and provide customised feedback instantaneously via the chat functions or within 24 hours depending on the software. Plus, business advisors and accountants can easily access your files providing instant and accurate support and advice. Connecting a bank account to an accounting software raises security concerns for most business owners. Cloud software offers multiple layers of security as standard. This gives you features such as user control access and authentication, data encryption, network protection, alongside secure data centres and monitoring. Most people think cloud software is expensive, but it’s quite the contrary. You pay a fixed monthly fee, which distributes the expense across the year, helping you avoid large upfront charges. Get in touch with us and we’ll get you and your business floating on cloud 9 in no time! 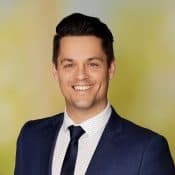 Should you have any questions in relation to cloud computing solutions for your business, please contact Ben Hitchings, Business Advisory Senior Manager, for assistance.